Alright, time to catch all of y’all up on what we’ve been doing! 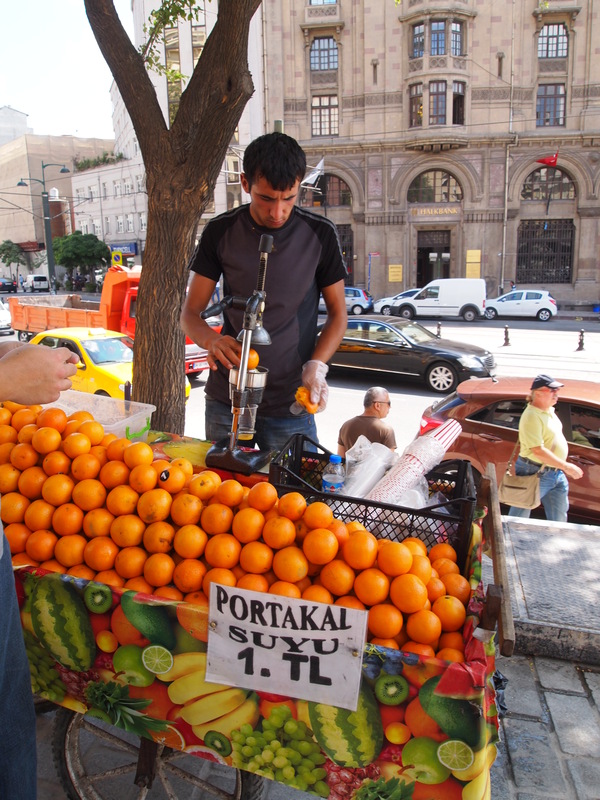 On Wednesday, our first full day in Istanbul, we started off the morning with some fresh-squeezed orange juice on our way across the Galata Bridge. 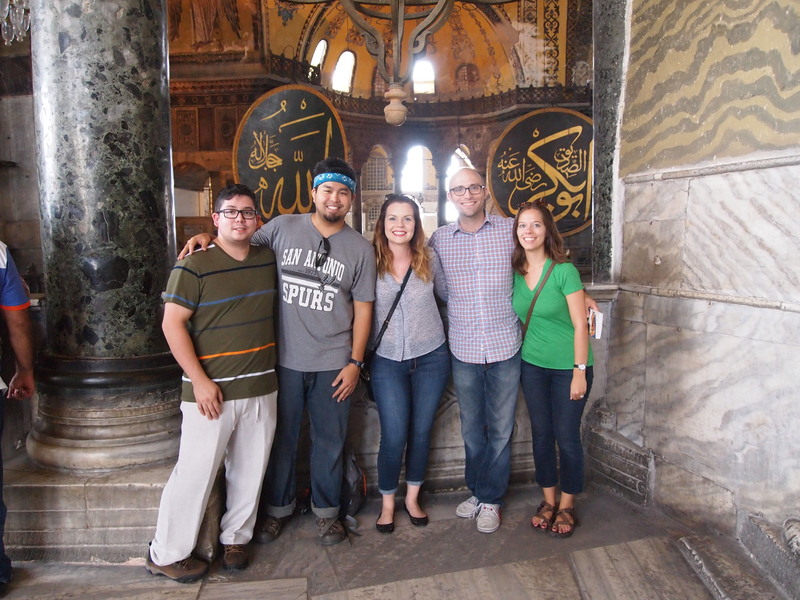 After crossing the Golden Horn we grabbed a quick bite before our hike up to Hagia Sophia (Ayasofya). 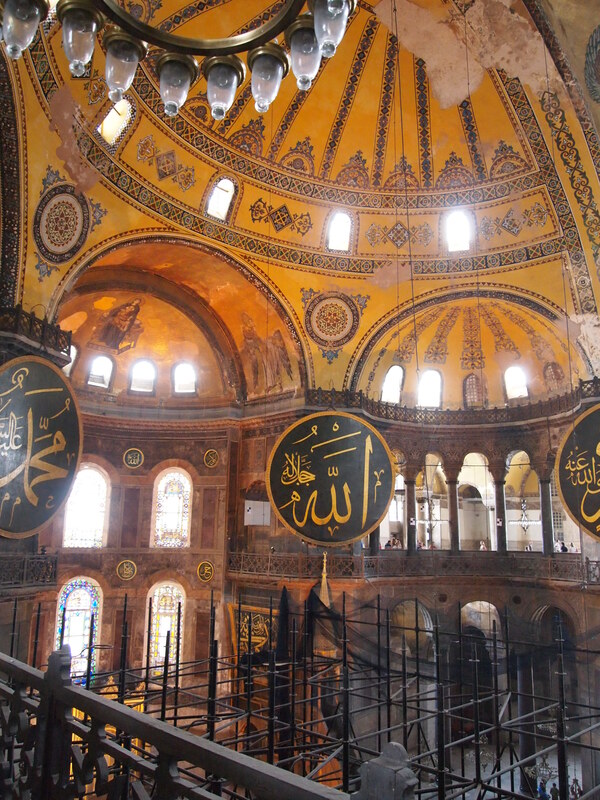 Built on the remains of at least two other churches, Hagia Sophia was originally built as a church. 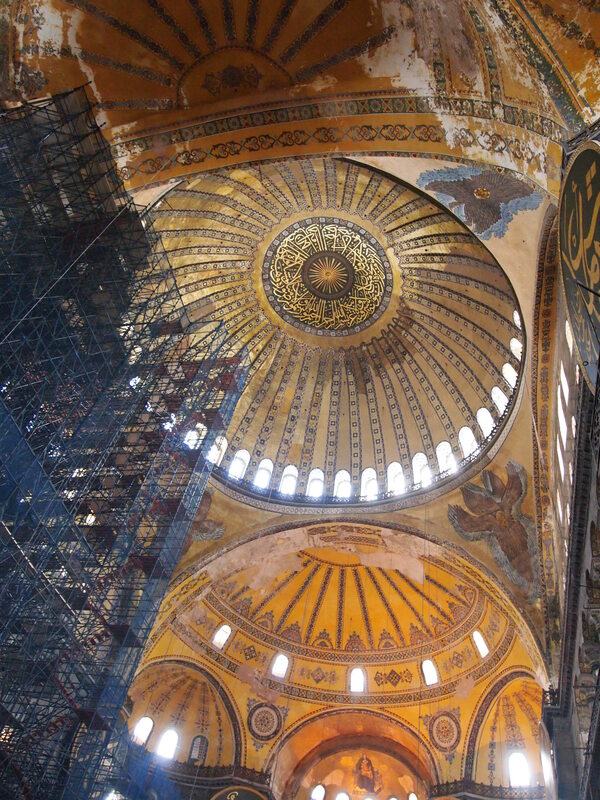 Commissioned by Emperor Justinian I, Hagia Sophia served as a church for nearly a millennium until the Ottomans took over the city. 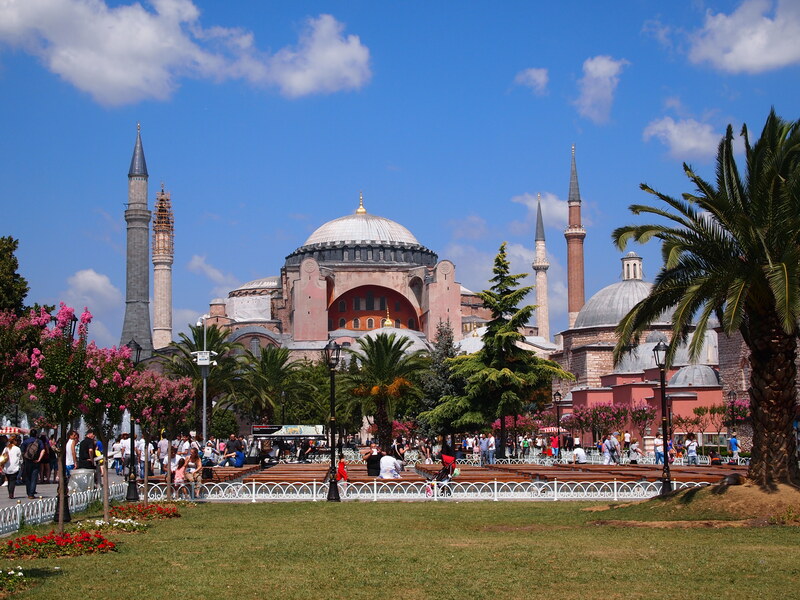 It was immediately converted to a mosque and renamed Ayasofya. 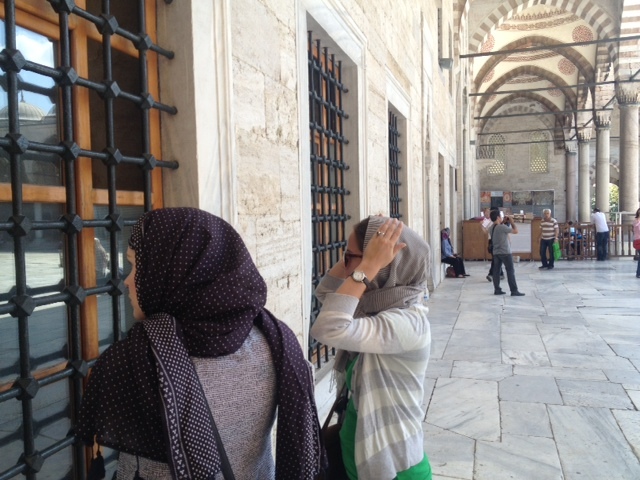 Today it’s a museum and most of what we saw was from its time as a mosque. It’s an astonishingly large structure! There is ongoing restoration (and has been for the last 2 decades!) which blocked one side of the mosque. Unfortunately the photos and my words really can’t do it justice. 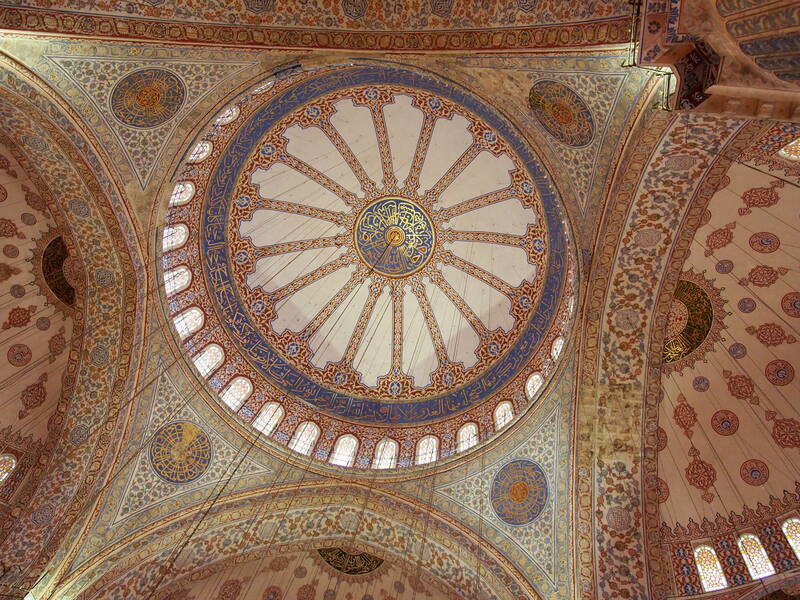 You really just need to come to Istanbul and see it with your own eyes. 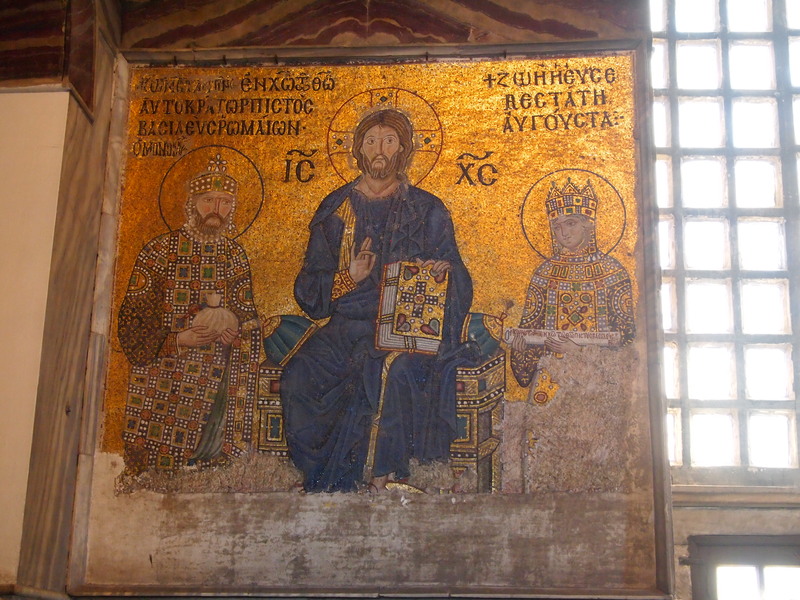 The mosaics are beautiful, even the parts that are faded or missing patches. 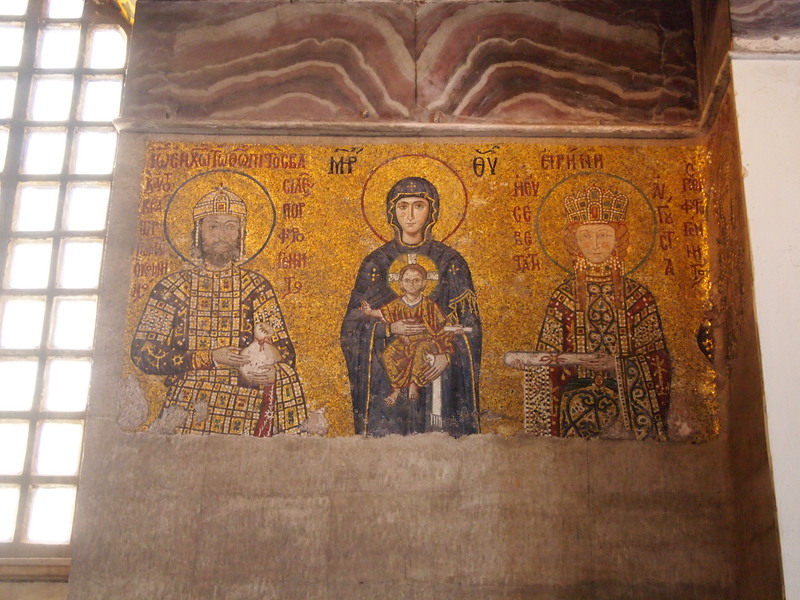 The mosaics from its time as a church are exquisite. 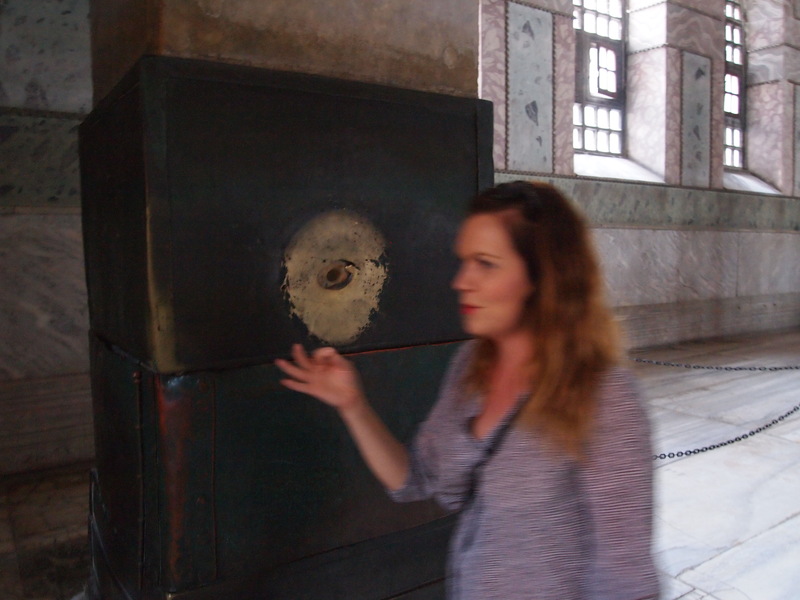 We also partook in a common ritual – the miracle column of St. Gregory or the “perspiring column.” In one column, in the corner of the mosque, there is a hole surrounded by metal. For centuries people have believed that this particular column weeps holy water so of course we all had to try it! You stick your finger in the hole and if it comes out feeling damp your prayer will be answered. If not, put your thumb in the hole again and turn your hand 360°. I think I was the only one who had a damp thumb after the first attempt and wouldn’t you know – my prayer was answered! The scaffolding has been up for over 2 decades! 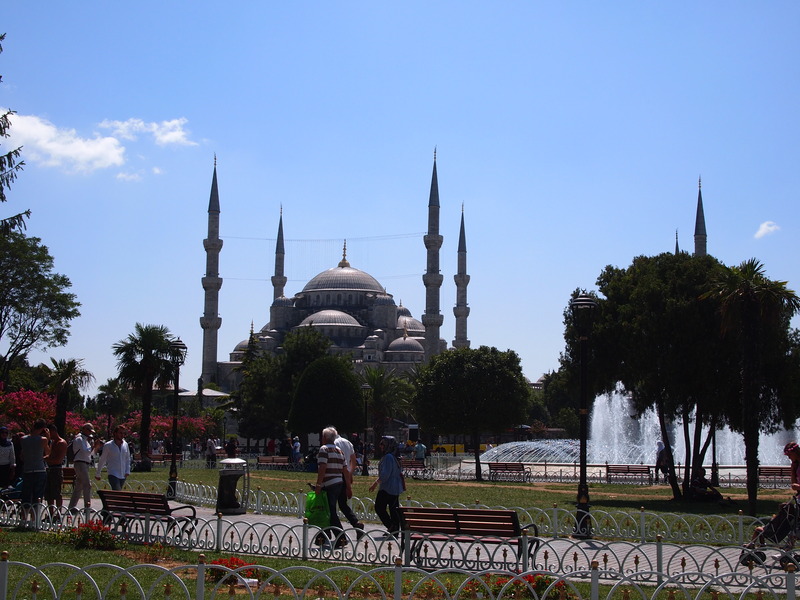 After leaving Ayasofya we ventured across the street to the Sultan Ahmed (Sultanahmet) Mosque or as it is more commonly known, the Blue Mosque. 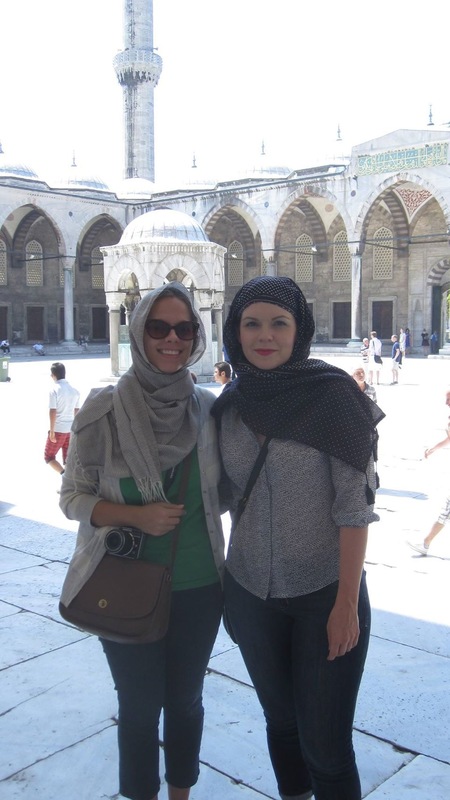 The Blue Mosque is a functioning mosque so we did have to take care to wear appropriate clothing (although if your attire does not meet the requirements, robes and scarves are now offered to keep you covered). Jenny and I had to cover our heads and our arms in addition to already covering our legs. The guys had to wear jeans. We all had to take off our shoes and keep them with us in plastic bags. 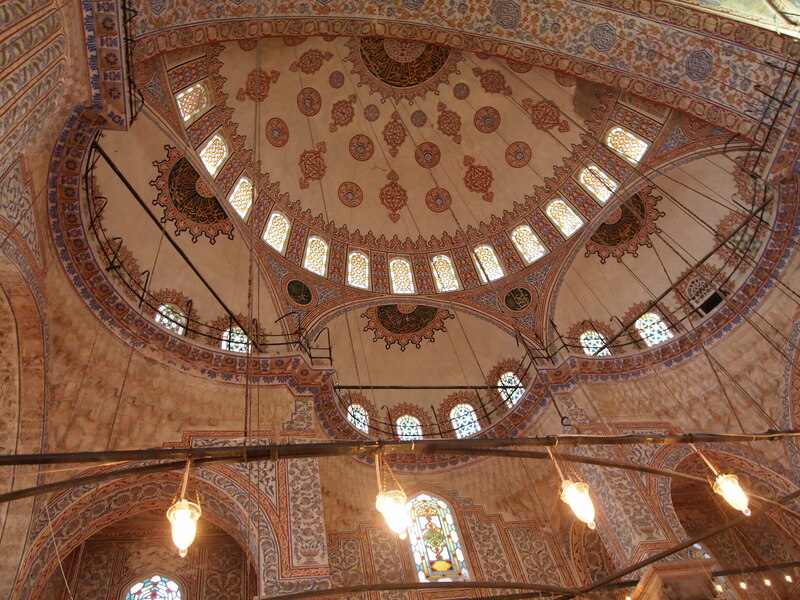 The mosque is stunning to say the least. Again, our photos really can’t accurately convey the magnitude of this structure. 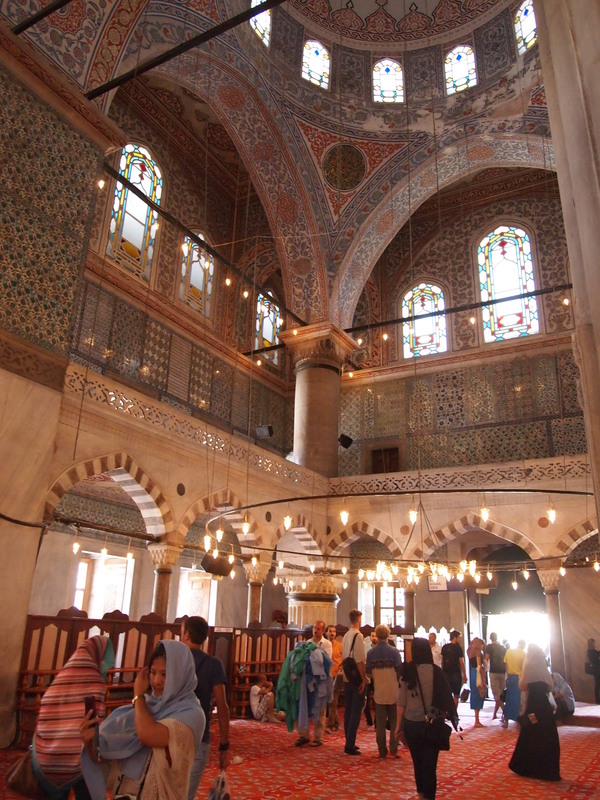 The interior is lined with 21,000 handmade tiles. 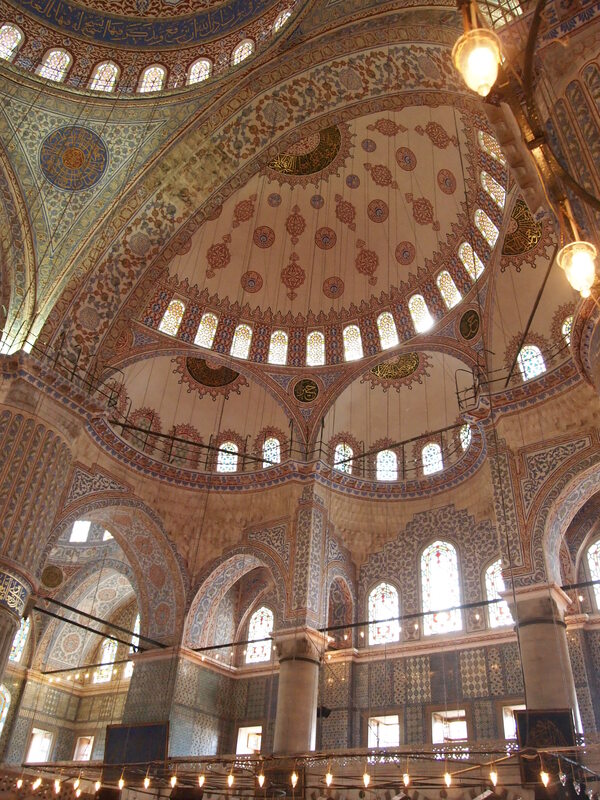 It is the dominant blue of these tiles that gives the mosque its common name. 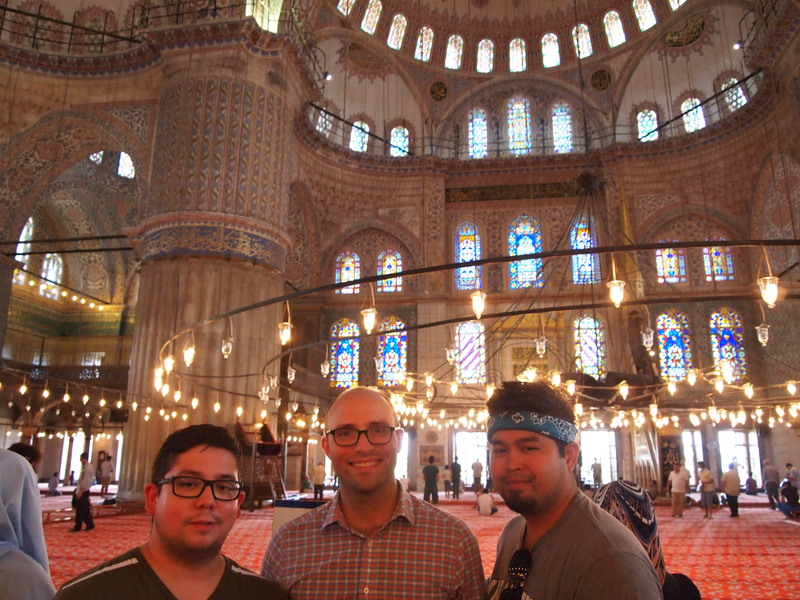 What really impressed me is that the main prayer hall can hold up to 10,000 worshipers at one time! It would be pretty incredible to see that. 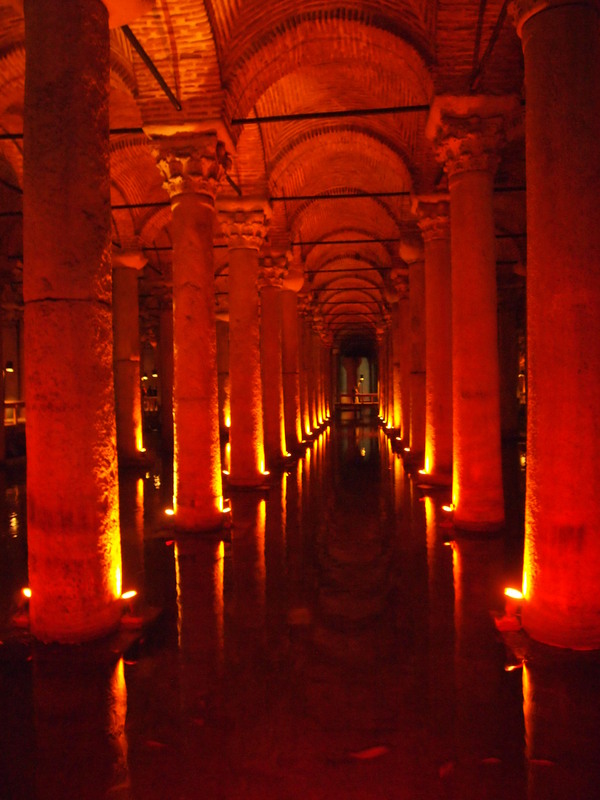 We ventured across the street to check out one more site in Sultanahmet – the Basilica Cistern. 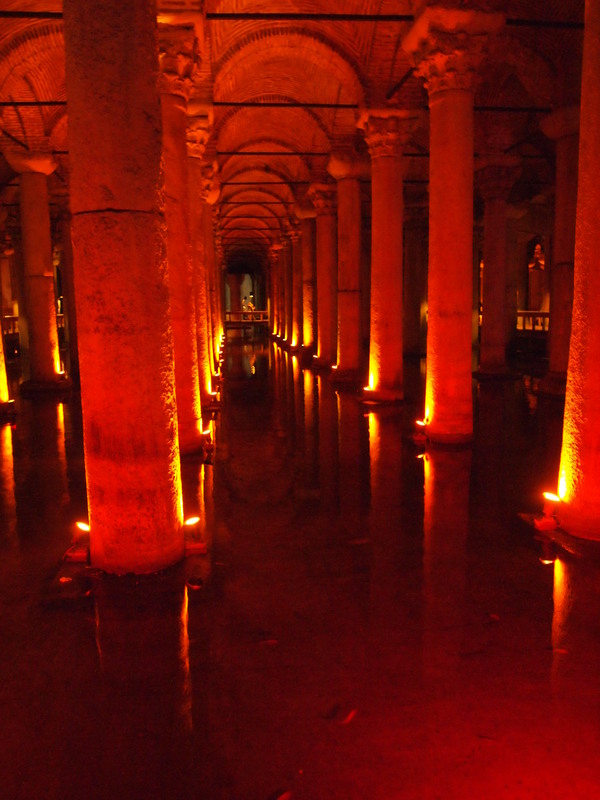 It’s an underground cistern that was also commissioned by Emperor Justinian I. Today you can walk through the cistern and stare at the fish below. 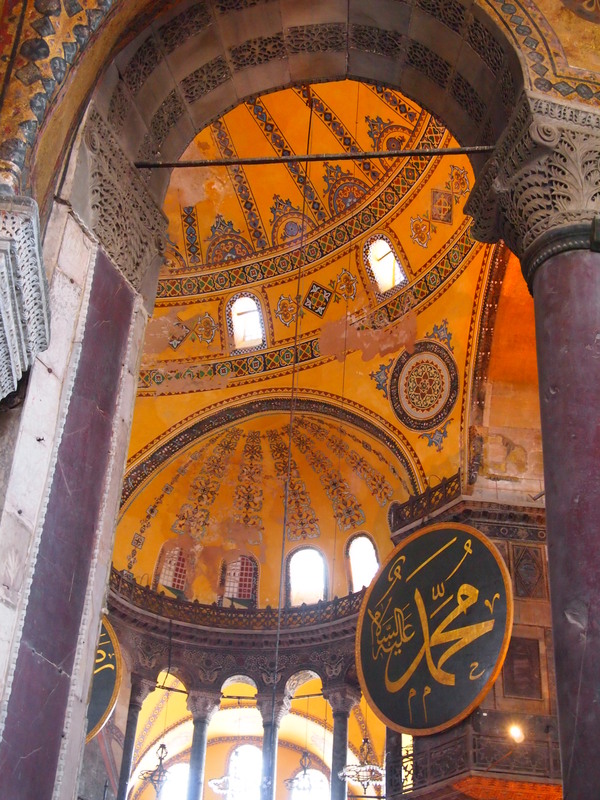 It’s almost completely dark save the small lamps lighting up 336 columns that are 1500 years old. It’s a little eerie, but mostly soothing with serene music playing in the background. We also took advantage of the cool, dry environment to take a break from the sun and heat. 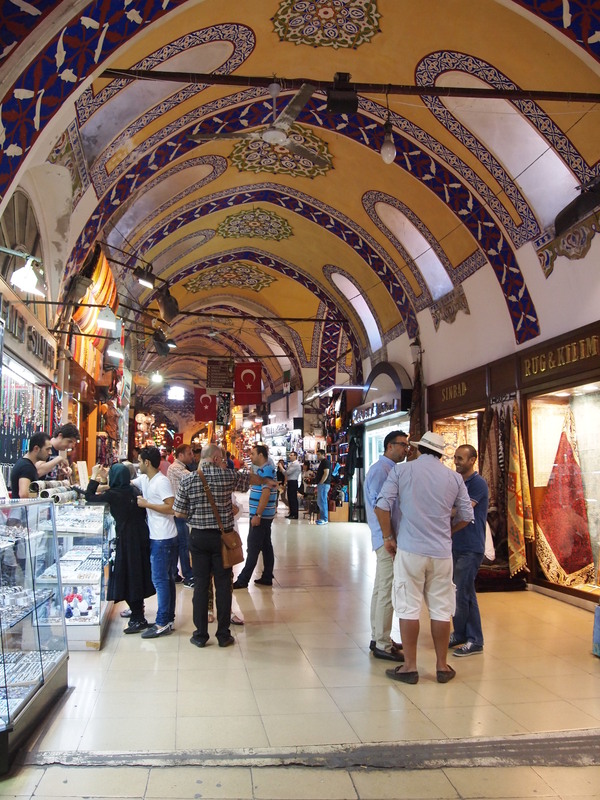 We decided to venture over to the Grand Bazaar after leaving the cistern. 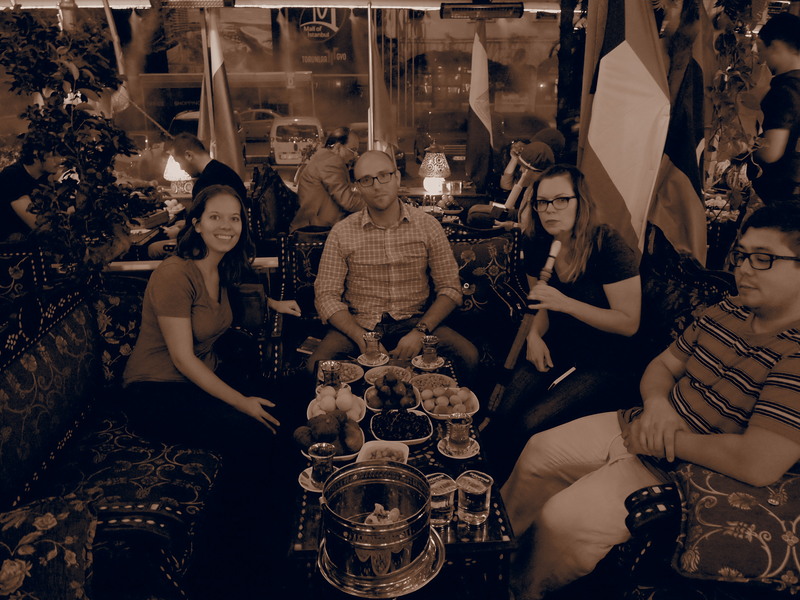 This probably wasn’t the best idea since we were all tired, hungry, and not prepared to haggle. Zach and Tim both made purchases and we walked around aimlessly for a while, but eventually we gave up in search of food and a place to rest our feet. 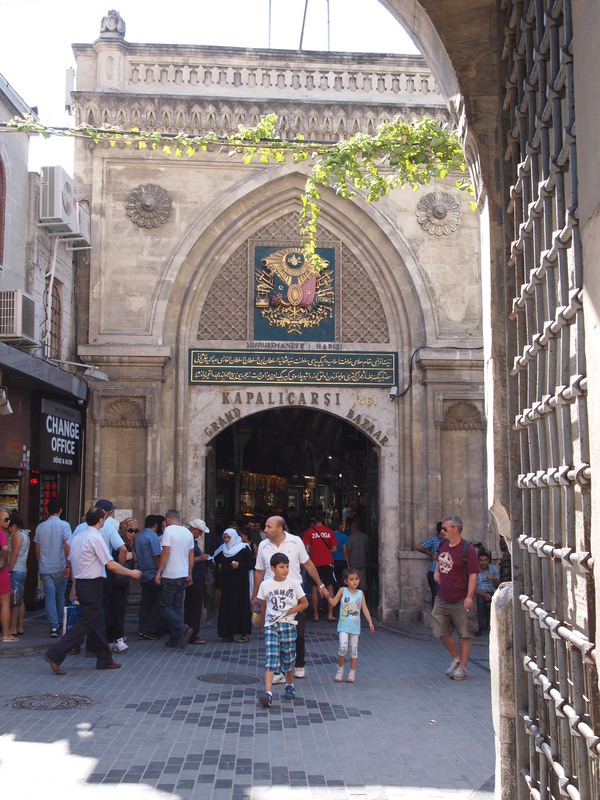 So we’ll have to make a return trip to the bazaar before we leave the city. 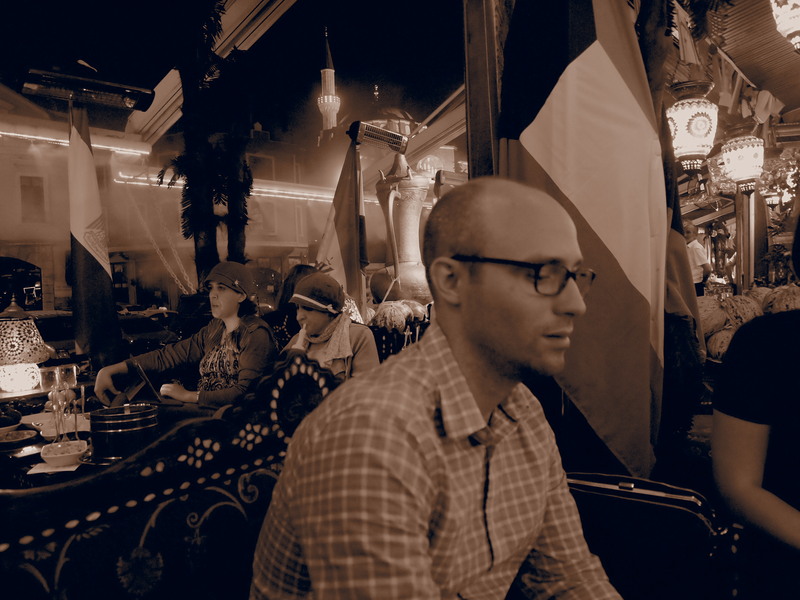 We took the tram back to our neighborhood and split up for dinner. Jenny and I ventured up to Galata Tower for some nice pasta and the guys ate pide (Turkish pizza) down the hill. After dinner we all napped. I don’t think we are quite over our jet lag; our sleep schedules are definitely off. Only Rudy has successfully gotten a full night of sleep so far. Revitalized after our naps we decided to go out and get a snack. 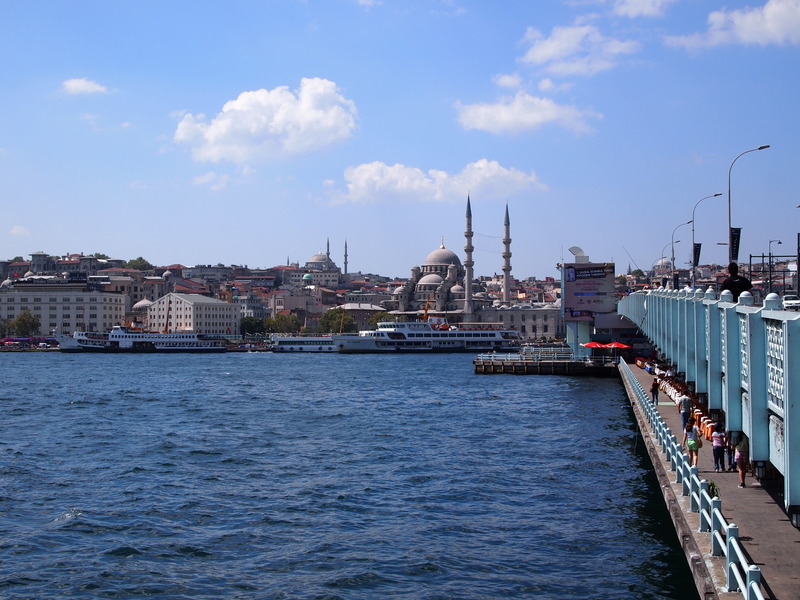 A short walk from our apartment found us at the Galata Konak Café, a quaint rooftop bar with excellent views of the city. We each had tea or coffee and shared a couple desserts. 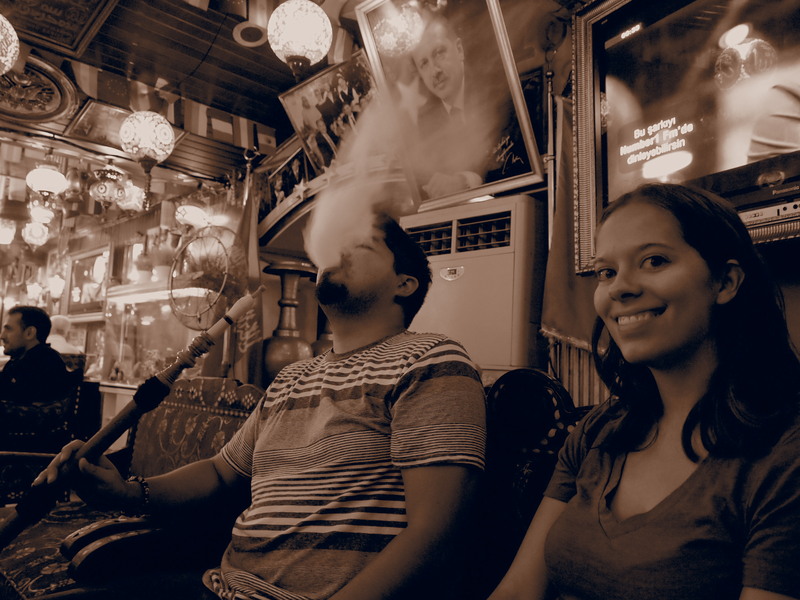 Then at midnight we ventured over to nargile row in the Tophane district. 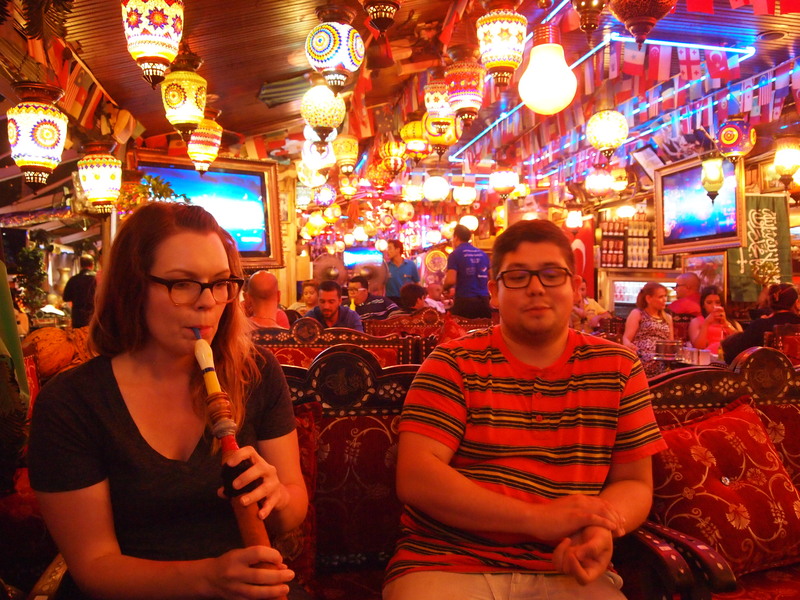 We ended up at Ali Baba’s, an expansive, luxurious nargile lounge that was exactly what we didn’t know we wanted. 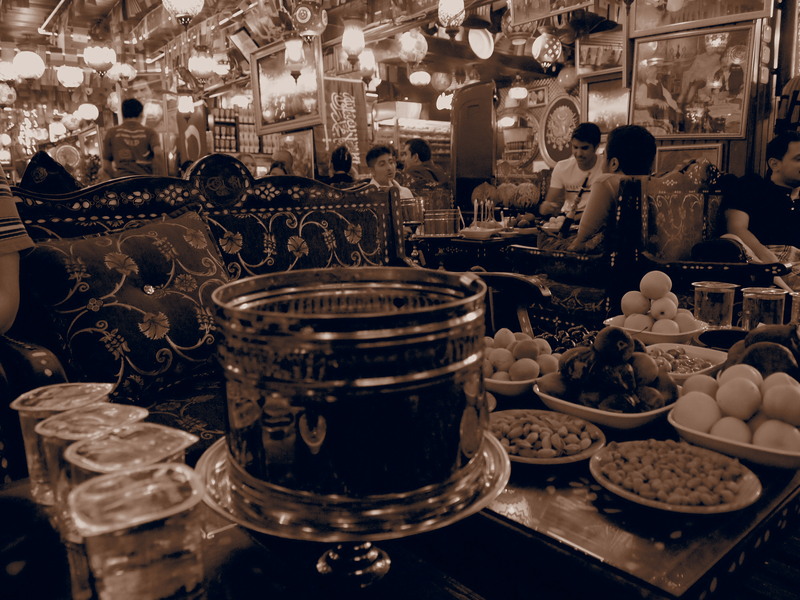 We were seated at a table with an amazing spread of fruits and nuts, plush red-upholstered benches and pillows, and surrounded by mosaic lanterns. It was great. Since Tim is our resident hookah specialist we had him order for us. 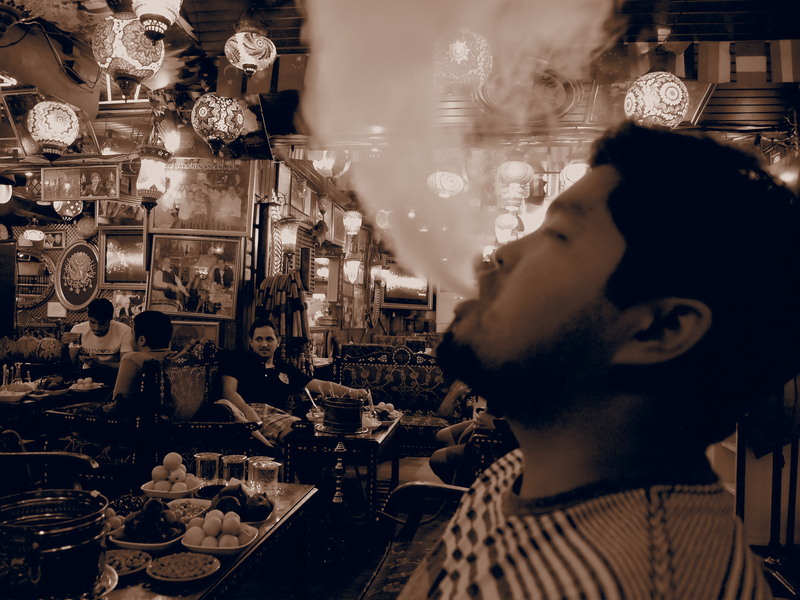 He chose a delicious watermelon mint shisha and we all ordered apple teas. Delicious! It was a great way to unwind from our busy day and relax. I think we’ll definitely be back before we leave.